West side of the old cart road between Durley Mill and Breach Hill (Blind Lane). The road is now a bridleway and footpath. Present state: The degraded remains of the platform survive as does the concrete base of the waiting shelter. The village of Durley is located approximately 7½ miles north-east of Southampton and 3 miles south-west Bishops Waltham and is served only by country lanes. At the turn of the twentieth century it had a population of 500 and that remains much the same today. When the Bishops Waltham branch was being planned, it was to pass just over a mile south of the village but, at this time, no station was planned or suggested. There was, however, a proposal to site a goods siding at Calcot bridge but when the line was built the siding was not provided. The line passed very close to Durley Mill and a level crossing was provided on the steep cart road leading from the mill to Breach Hill. Traffic over the crossing was mainly farm vehicles with some horse vans, pony traps and commercial delivery vans to or from Durley Mill. It is likely that the crossing was manned by a gatekeeper when the line opened, but on 27 April 1881 the L&SWR approved the construction of a rent-free cottage adjacent to the crossing on the down side for a platelayer, Mr Elliot. In return for free accommodation, Mr Elliot’s wife agreed to take on the role of gatekeeper without the L&SWR having to pay a gatekeeper's wage. There was no demand for a station to serve Durley until the arrival of rail-motors on the branch in November 1904. A local campaign for the provision of a rail-motor halt at the crossing was led by the Sciver family who ran Durley Mill. The cost of providing a halt was estimated at £44 and this petition was considered by the L&SWR on 16 August 1905, but at that time it was rejected. A further attempt to persuade the L&SWR to provide a halt at an estimated cost of £67 was made on 4 November 1909. This time the petition was successful and was approved by the L&SWR board. The Hants Chronicle reported that the halt opened on 23 December 1909 although it was not inspected by the Board of Trade until 24 January 1910. In his report, Major John Pringle RE stated: ‘I made an inspection today of the new works at Durley between Botley and Bishops Waltham on the London and South Western Railway. A new platform has been constructed on the north side of the single line about 2¼ miles south-west of Bishop's Waltham. The platform has a length of 120 feet, a width of about 8 feet and is raised 3 feet above rail level. It is properly fenced and lighted, and access is provided from the adjoining public road level crossing by means of a ramp. Nameboards ‘Durley Halt’ have been fixed. There is no shelter and no signals have been provided.’ He approved the opening of the halt for public use on the proviso that ‘further accommodation would be provided if such should be found necessary’. It is assumed that he was referring to the provision of a shelter. As passenger numbers came up to expectations in its first year approval for a timber open-fronted shelter on a concrete base at a cost of £35 was given on 3 November 1910. The earlier proposal to provide a goods siding at Calcot Hill bridge was revived and discussed by the L&SWR on 1 December 1910 and was again considered in 1912 at a cost of £900 which included the cost of purchasing a suitable plot of land from Dr Maybury. Although the L&SWR board approved the construction of the siding Dr Maybury was reluctant to sell his land. It is unclear if the siding was ever built; company records are not clear on this subject, however as produce from Durley Mill continued to be handled by Botley station and the siding is not shown in any available working timetables it seems likely that it was never built. In its early years, traffic at Durley was never heavy but it was steady. Although the halt was named Durley it was some distance from the village and was actually in the parish of Curdridge; nevertheless it was well placed to serve the small communities of Calcot and Frogmill. 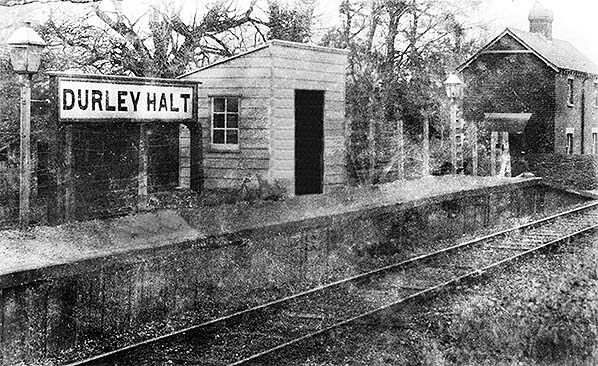 Passengers using the halt consisted mainly of shoppers travelling to Botley or Bishops Waltham, schoolchildren attending Prices School in Fareham and workers from Durley Mill. In later years passenger numbers were in decline following the introduction of a new bus service between Durley and Bishops Waltham in 1925. By then the only regular source of revenue was from workers at Durley Mill which was a two-minute walk from the halt. In a competition run by a railway magazine, Durley won the prize for being the station in Britain at which one was most unlikely to alight! 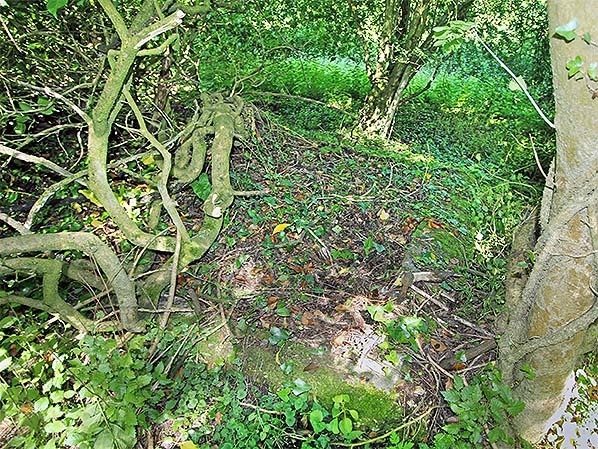 After closure in 1932, the platform facing and edging was removed along with all fixtures and fittings leaving a degraded mound of earth and cinders and the concrete base of the waiting shelter. The level crossing continued to be manned until the retirement of Alice Tubbs in April 1954; she had been gatekeeper since 1907. From 1927 the job also included handling a very small quantity of parcel traffic at the halt. Alice Tubbs was the daughter of Mr & Mrs Elliot so the crossing keeper's job had remained with one family from the outset. Alice Tubs was not replaced after her retirement and thereafter the job of opening and closing the gates for the daily goods service was undertaken by the train guard. 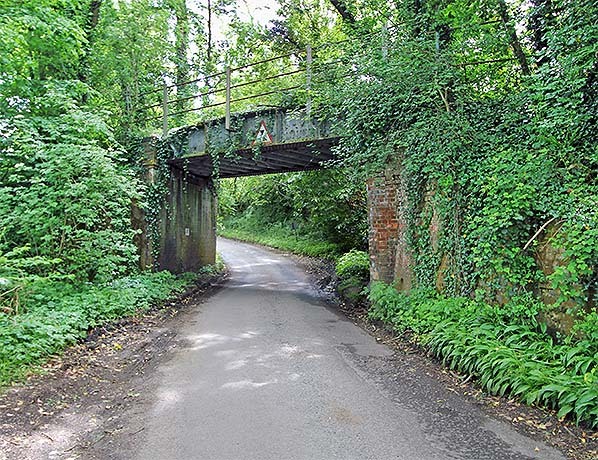 Today the old cart road is closed to all traffic between Blind Lane and Durley Mill and it has been downgraded to a public footpath and bridleway with two wooden bridges replacing the ford over the River Hamble. Durley Mill is now a private residence; the eighteenth and nineteenth century building ceased milling on 3 April 1965 and was sold the following year. It was Grade II listed by English Heritage on 6 March 1967 and still retains its 1875 waterwheel and some other machinery. Two girder bridges taking the railway over minor roads (Calcott Hill and Wangfield Lane) either side of the halt are extant. I am one of the Ward family that lived in the cottage for several years in the fifties. It was of course closed when we moved in. My family consisted of my father who was a ganger on the Botley to Eastleigh line, my mother who is still alive and eight children. The cottage had only two bedrooms so it was very cramped. There was never any running water or a well. We had to walk about 100 yards up the line to a spring coming down onto the side of the track. We had no electricity for some time until a line was put in over the river. Also no proper sanitation, only an outside privy (hole with a top on). Times were very hard for such a large family living there. As children we played on the remains of the station and enjoyed the freedom of living in the heart of the country. The road to the track was almost impassable then as it was only used by very few vehicles to the house. The train came daily for some time from Botley to Bishops Waltham, and then perhaps once or twice a week before it stopped. The train driver would often throw coal over the fence into the garden to help keep us warm. I remember the last train going through, we had been told that the line had closed for good and we were playing on the line when a train came along with carriages and people on board. We moved just after before my 12th Birthday so I think we were there for several years as I remember being in the junior class at Curdridge school when we first came to the Halt. The Bishop's Waltham branch had its origins in a much grander plan put forward in the early 1860s. A group of businessmen in the Southampton area proposed a railway running across eastern Hampshire into Southampton. They were led by Arthur Helps, a prominent national figure (he had recently been made Clerk of the Privy Council) and writer. He owned an estate near Bishop's Waltham and had financed the creation of the town's Coke & Gas Company and a brickworks. The aim of the Bishop's Waltham, Botley & Bursledon Railway (BW, B&BR) was to link the proposed Petersfield & Midhurst Railway to the main line into Southampton which was owned by the London and South Western Railway (L&SWR). The L&SWR was a large and established company having built the south-western main line between London and Southampton in the 1830s. The promoters of the Bishop's Waltham Railway, like many similar small railway undertakings, hoped to arrange for the L&SWR to operate the line once it was built in return for a share of the takings. The L&SWR objected to the proposed BW, B&BR as a potential competitor to its own line and refused an agreement. However the L&SWR was equally wary that its main rival, the London, Brighton and South Coast Railway (LB&SCR) would secure the rights to operate the line itself and thus be able to run its services right into the heart of L&SWR territory. The L&SWR and the BW, B&BR reached an agreement that the smaller company would reduce its plans to a simple branch between Botley and Bishop's Waltham. The L&SWR would operate the line at a favourable rate and would consider an extension to Petersfield in the future. The BW, B&BR changed its name to the Bishop's Waltham Railway Company (BWR). John Collister was appointed as engineer for the line and he immediately started work surveying the proposed route and preparing working plans for the construction of the line. The Bishop's Waltham Railway Act received Royal Assent on the l7 July 1862. Messrs. Rilson and Ridley were appointed as contractors and as sufficient money had already been raised for the construction of the railway's earthworks and track, work was quickly underway although no plans had been drawn up for the terminus at Bishop's Waltham and a temporary station was initially proposed so the line could be opened as quickly as possible. By the end of the year, half the available capital had already been spent and a Parliamentary Bill was prepared seeking an increase in the authorised capital of the company in order to complete the work. In April, the Board announced that the line was ready for opening to passenger traffic although no station of any kind had yet been built at Bishop's Waltham. On 8 May a tender was let to a Southampton contractor for the building of a temporary terminus to be completed within a fortnight. Once this had been finished the line was inspected by Captain Rich RE for the Board of Trade, a requirement before any new line can be opened to the public. Captain Rich reported, ‘The new line is single throughout, with sidings at Botley Station and at Bishop's Waltham.....land has been purchased for a double line......All the bridges appear to be well and substantially constructed. There are no engine turntables but as the line is only about four miles long, they might be dispensed with, on condition that Tank Engines only are used. There is one public level crossing at Bishop's Waltham Station.’ Some additional minor work and alterations were required by Captain Rich and he concluded that the line could be opened for passenger traffic once this work had been completed and on receipt of a guarantee that only tank engines would be used to ensure that the line was not worked at a great speed because of its many tight curves until a turntable was provided at Bishop's Waltham. These stipulations were quickly agreed and notified to the Board of Trade on 30 May. Once the line was open, the BW board were keen to start work on Bishop's Waltham station as soon as possible but they were forced to take out further loans and a mortgage to fund the construction of the passenger station and a goods yard. By August 1864, work was underway and at a shareholders meeting at the end of that month it was stated that the facilities for both passengers and goods were nearing completion. The completed terminus eventually opened in March or April 1865. The BWR tried to fix an agreement with the L&SWR to extend the line further in search of extra traffic and a second company, the Bishop's Waltham & Petersfield Railway (BW&PR), again led by Arthur Helps, was formed to try to secure investment for the project. This unfortunately coincided with a minor banking crisis and a recession in the British economy which saw investment in new railway projects dry up. 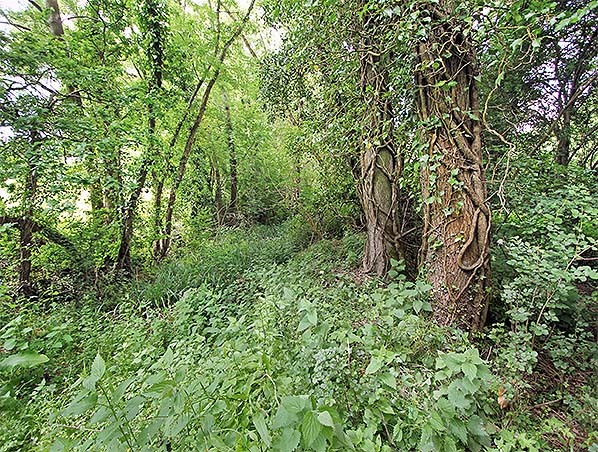 It also further reduced traffic over the Bishop's Waltham branch line which was dealt a fatal blow in April 1867 when the Bishop's Waltham Clay Company, the local brickworks and one of the railway's main customers, went into liquidation and ceased production. The cattle plague which had broken out in southern Hampshire, coupled to the reduction in importance of Botley Market owing to the establishment of the large central market at Southampton, also took its toll. The BW&PR plans were abandoned in 1868. In the 1860s the L&SWR proposed its own railway line between Alton and Petersfield; this railway would have had a junction near Warnford, on the west side of the Meon valley from where a line would run into Bishop's Waltham, thus connecting to Botley and the Eastleigh to Fareham Line. This would have required major works of civil engineering including a large bridge or viaduct, and would have put Bishop's Waltham on a major railway in the region. The plans never progressed. 1871 saw an upturn in fortunes for traffic when the abandoned Clay Company works were acquired by Mark Henry Blanchard who recommenced production at Bishop's Waltham in addition to his London business. A general increase in traffic may have been responsible for the introduction by 1873 of an additional morning return working. During the 1880s, when the L&SWR was looking for a site for its main locomotive and carriage works, a group of Bishop's Waltham businessmen offered a proposal to site the works at Bishop's Waltham. The L&SWR did conduct a detailed study of the proposal, but the site of Eastleigh was chosen instead, being on the main line. Eastleigh grew from a village smaller than Bishop's Waltham to a large industrial town centred on the works. 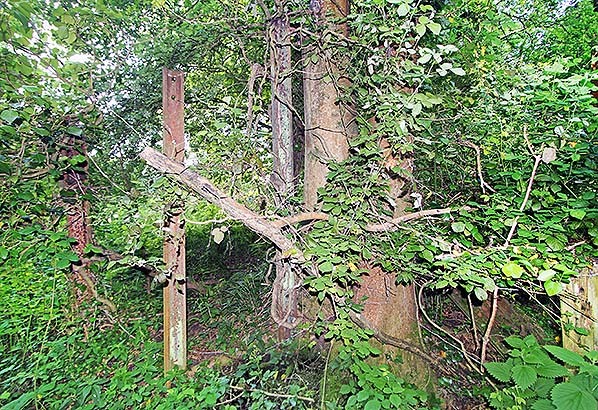 In 1883 there was a proposal to extend the branch to Droxford but nothing came of this. An extension to Droxford was again proposed in 1901, during the construction of the L&SWR's Meon Valley Railway. On this occasion, a group of local investors formed a company to build a line northwards from Bishop's Waltham to the new station at Droxford. The line would be built under the Light Railways Act 1896 to keep down costs. 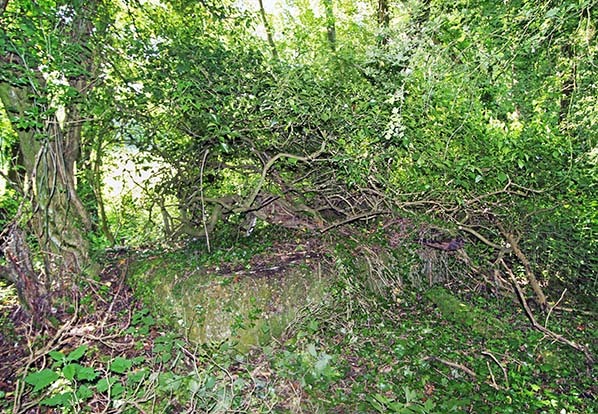 The L&SWR objected to the plans, citing the disruption a branch line would cause to its own operations at Droxford station. The Board of Trade was also sceptical that the line would remain within the terms of the Light Railways Act since it would require major earthworks, a tunnel and a large bridge or viaduct to cross the River Meon. The scheme failed to obtain an Act of Parliament and was abandoned. Whilst the line was usually only lightly used, with modest passenger numbers and low levels of freight, the line usually saw a period of frenetic, heavy use in the summer months during the strawberry harvest. Southern Hampshire (including the area around Bishop's Waltham, Botley, Fareham and Titchfield) was the UK's main strawberry growing region and during the harvest there was a near-continuous stream of special trains from the region to the London markets. Botley station had numerous sidings to accommodate the special trains the L&SWR put on for the harvest, and the Bishop's Waltham line was key to shipping produce from the Meon Valley and the surrounding region to the main line. Despite the improvements to the weekday service many local people were unhappy that no Sunday service had been provided since 1886 and a well supported petition was sent to the L&SWR in August 1889 requesting the reintroduction of a Sunday service. This and a subsequent similar request were declined by the L&SWR. In 1890 changes were made to the existing train timings which quickly proved unpopular with local people. These led to further petitions and resolutions being put to the company but all fell on deaf ears until, on 5 November 1904, it was announced that steam railmotors that had been withdrawn from the Basingstoke to Alton line in August could be used on the Bishop's Waltham and Turnchapel branches to improve their service. This was approved and appears to have been put into effect immediately. The Bishop's Waltham branch was one of the few lines in the region to be worked by railmotors. These were popular for light rural lines around the turn of the century, and consisted of a small 0-4-0 type locomotive rigid-coupled to a single carriage. This provided a low-cost and simple vehicle. However, railmotors lacked the power to pull any other carriages, and so were unable to cope with sudden high passenger numbers, such as occurred on market days or public holidays, and so were replaced by light standard tank engines when the need arose. WW1 brought few changes to the line. Despite a reduction in passenger numbers a service was maintained throughout the war although the railmotors were withdrawn circa 1915 to be replaced by conventional locomotives. There was some additional traffic from 1916 when Northbrook House in Bishop's Waltham was commandeered for use as a military hospital. In 1917 some 7,000 troops of the 3rd, 4th, 5th an 6th Battalions of the Hampshire Regiment arrived and were billeted in and around the town but this brought little extra traffic to the railway as most military movements went by road to Gosport and Portsmouth. One heavily laden troop train did depart from Bishop's Waltham in late 1917 / early 1918 taking troops to a camp in Scotland. This was probably the heaviest and longest train ever to use the branch. 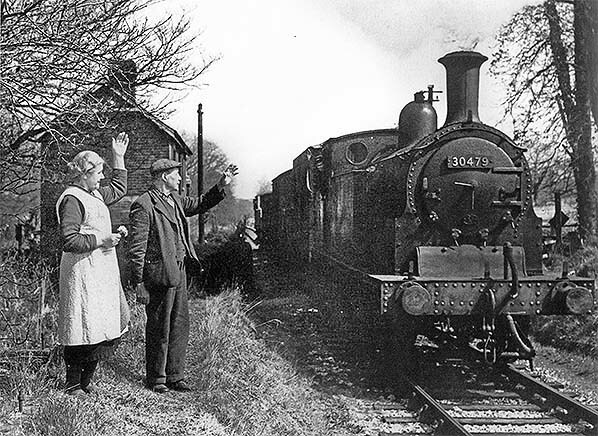 Although the passenger service had been withdrawn, Bishop's Waltham station remained open with a twice-daily goods service; this was soon reduced to one train a day. The signal box at Bishop's Waltham closed on 16 December 1935; all signals were removed and the branch was converted to hand operation. Initially WW2 brought no changes but that was to change as the war progressed. When the bombing of Portsmouth intensified in 1940 the main Portsmouth warehouse belonging to Timothy Whites (chain of dispensing chemist and houseware stores) was destroyed. The company relocated temporarily to Swanmore House close to Bishop's Waltham for 3½ years and during that period a large volume of merchandise was handled by both Bishop's Waltham and Botley. Parcels and small goods at Bishop's Waltham and large goods at Botley. Later in the war, the Royal Engineers requisitioned Hazleholt Park to the north-east of Bishop's Waltham. A large store was established there and a wide variety of military goods were brought in by rail to Bishop's Waltham. At its peaks, this amounted to one train a day carrying goods such as dannett wire, pickets and steel hawsers, all believed to have been intended for the home defence following the Dunkirk evacuation. Everything arriving at the Bishop's Waltham terminus was handled by military personnel who took over the stationmaster's office and established a REME workshop at the rear of the yard. The store was dismantled after D-Day but the branch still had a part to play in the war effort becoming a long siding for the storage of empty tank wagons. During this period all goods traffic normally handled at Bishop's Waltham was transferred to the yard at Botley. After the war branch life returned to normal with the return of the daily goods train. Nationalisation in January 1948 brought no immediate changes. With the popularity of rail enthusiasts excursions growing in the 1950s the branch once again handled occasional passenger services. The Railway Correspondence and Travel Society organised a railtour just covering the Bishop's Waltham branch. A second railtour was organised by the Stephenson Locomotive Society on 3 May 1953 running from Gosport to Bishop's Waltham then on to Havant. By the middle of the 1950s there had been a huge drop in the type goods being handled It was clear that the branch was now living on borrowed time. The last railtour to visit Bishop's Waltham was the Branch Line Society's Portsmouth Area railtour on 7 March 1959. Traffic dwindled even more that year, unable to compete with road transport. Following the withdrawal of the Saturday goods service and the weekday service reduced to two or three trains a week so it came as no surprise when final closure was announced for 27 April 1962. Shortly before the track was lifted the Hampshire Narrow Gauge Society looked at the possibility of laying a 2' gauge line along the track bed from Maddoxford on the outskirts of Botley to Bishop's Waltham where a new station would be built to the south of the level crossing. These plans persisted till 1964 but eventually they lost interest and the proposal was forgotten. 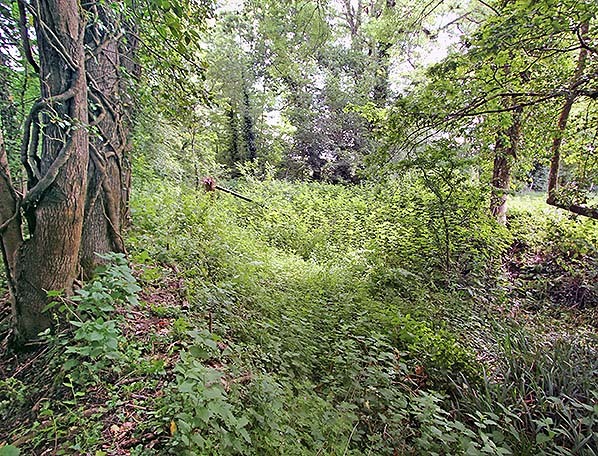 Bishop's Waltham station was demolished in the late 1960s to make way for road improvements but much of the track bed is still traceable and short section to the south of Bishop's Waltham is now a public footpath. Some track still exists as a long siding at the southernmost end of the line. This is used by Foster Yeoman who operate an aggregate railhead depot and coated roadstone plant at Botley station. Two iron overbridges either side of Durley Halt are extant. This is the only known photograph of Durley Halt when it was still open; it dates from the L&SWR period. The halt was provided with three oil lamps and a timber shelter which was added a year after the halt opened. The gatekeeper's cottage was built in 1881. The crossing is between the cottage and the halt. 1963 1:2,500 map. Although published in 1963, after closure of the line, the survey would have been at least a year earlier when the line was still open. All the buildings at the level crossing have now been demolished. Durley Mill was still operating at this time; it closed on 3 April 1965 and was sold the following year. Gatekeeper Alice Tubbs and her brother Charlie stand on the degraded remains of the platform at Durley Halt in April 1954 at the time of her retirement. Alice had been gatekeeper since 1907 taking over the job from her mother who had been gatekeeper since the 1880s. No.30479 is a Drummond auto-fitted M7 tank that was built at Nine Elms in December 1911 and given the number 479 by the L&SWR. This 0-4-4T lasted in service until withdrawal from Three Bridges shed in October 1963 and was cut up a month later. BR staff pose for the camera at Durley level crossing in March 1955; the degraded platform ramp is seen on the left. By this date the crossing gates were operated by the train guard. No.30356 is hauling empty coal wagons. This is another a Drummond auto-fitted M7 tank that was built at Nine Elms in October 1900.This 0-4-4T lasted in service until withdrawal from Fratton shed in December 1958. Some members of this class lasted in service until 1964, and two examples have survived into preservation: no.245 in the National Railway Museum, and 53 (as BR 30053) on the Swanage Railway. 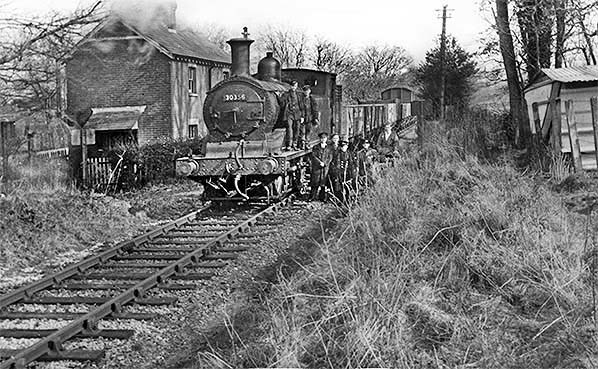 The daily goods service making its return journey passes the site of Durley Halt in January 1957. The photographer is standing on the degraded platform. This M7 No.30375 was built at Nine Elms in May 1903 and survived until September 1962 when it was withdrawn from Plymouth Friary shed to be cut up at Eastleigh works the following month. 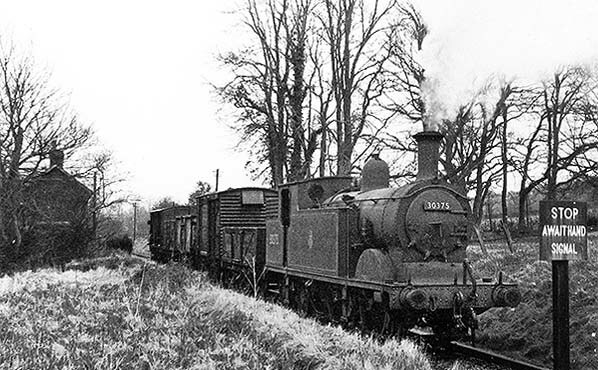 M7s provided this service on the Bishops Waltham branch until 1958 when they were replaced by ex-LMS Ivatt 2-6-2T tanks. After the retirement of Alice Tubbs in 1954 the gatekeeper's cottage was occupied by the Ward family for a short time; it is assumed a member of the family worked for the railway. By 1963 the cottage had been demolished. 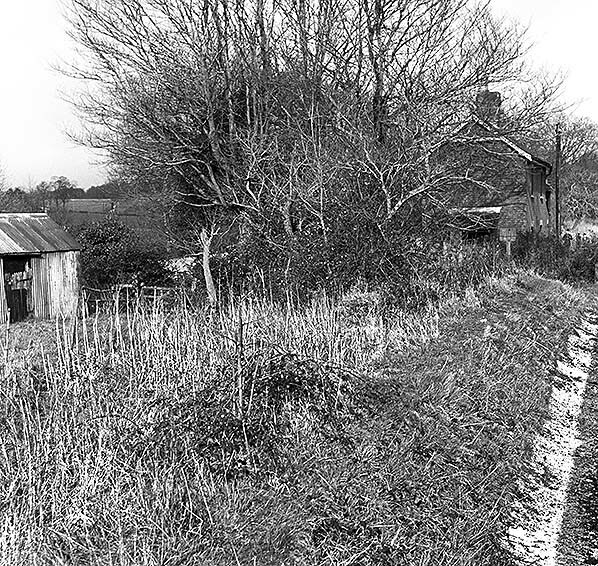 The degraded platform at Durley Halt seen from the Branch Line Society ‘Portsmouth Area Railtour’ as it passed through the site of the halt on 7 March 1959. The tin hut on the left predates the halt and is shown on the 1896 map above; its purpose is not known. Two vertical sections of rail are seen adjacent to the level crossing in June 2015. They probably held railway signs at some time. A similar section of rail is used to support a sign in the picture above. Looking north-east along Durley Halt platform towards the level crossing in June 2015. The platform is still noticeably raised above the adjacent trackbed. Looking south-west along Durley Halt platform towards the level crossing in June 2015. The platform is still noticeably raised above the adjacent trackbed. The waiting shelter was beyond the two trees. Calcot Hill bridge to the north-west of Durley Halt in June 2015. A similar bridge over Wangfield Lane to the south-east of the halt also survives. Calcot Hill bridge is the site of the proposed goods siding that was probably never built.